Updated 6:19 p.m. | Democratic front-runner Hillary Rodham Clinton appears headed back to the campaign trail politically unscathed, after being peppered for hours by Republicans with questions about the deadly Benghazi attacks. In fact, Republicans’ lack of any hard evidence linking the former secretary of State directly to the department’s admitted missteps before and during the terrorist strikes that killed four Americans could give Clinton new campaign-messaging fodder. As the clock hit the sixth hour of the hearing, Clinton returned to the room energetic, wearing a wide smile as she enthusiastically greeted audience members. Unlike a 2013 Senate Foreign Relations hearing, Clinton showed very few signs of frustration or anger — and, at times, seemed to be enjoying the spectacle and back-and-forth with Republicans. If the committee has uncovered any smoking-gun evidence, it held fire Thursday. Instead, Republicans largely questioned Clinton about email procedures, bureaucratic processes and what they described as her questionable judgement about a key confidant. 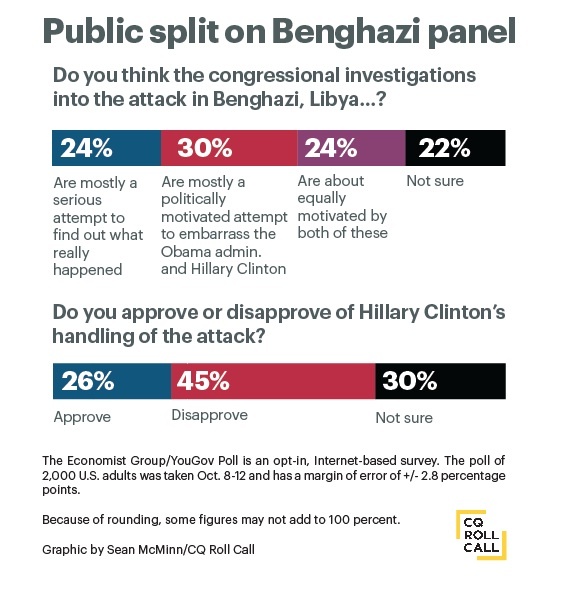 It was on the latter issue that Republicans pressed the hardest. Rep. Trey Gowdy, R-S.C., chairman of the special committee, held his questions until the session’s three-hour mark. Once he took the microphone, he focused on Clinton confidant Sidney Blumenthal, who advised the then-secretary of State. “The documents show he was your most prolific emailer on Libya,” Gowdy said, pointing out the White House prohibited Clinton from hiring Blumenthal as a State Department employee. Gowdy, a former prosecutor, attempted to discredit Blumenthal. He claimed Blumenthal “could not get hired” by the government and “could not pass a background check.” He also mentioned unspecified “business interests” held by Blumenthal inside Libya, and questioned from where he obtained the information about Libya he shared with Clinton. She questioned how those comments help the special committee determine how U.S. Ambassador J. Christopher Stevens and the other three Americans died. Clinton attempted to brush aside Gowdy’s assertions that Blumenthal had “unfettered access” to her and was sending her inaccurate and potentially tainted information. Rep. Mike Pompeo, R-Kan., attempted to show Clinton failed to comply with the findings of various post-incident State Department reviews and was incompetent in her job. Several times, she responded in the affirmative that she had complied with those reviews — and followed several with detailed accounts of actions she ordered. She came back by explaining her belief that it is unwise for any secretary of State to make on-the-ground security decisions from Washington, arguing “security experts” are best suited and informed to make such calls. Pompeo merely responded, “Leaders lead.” Clinton did not acknowledge the remark. Fireworks were expected during the high-profile session pitting Clinton against a GOP-created special panel that has been investigating the September 2012 attacks at the U.S. consulate. But the day’s biggest sparks came during an exchange between Gowdy and Rep. Elijah E. Cummings of Maryland, the panel’s top Democrat. Cummings moved to make public Blumenthal’s private testimony, but Gowdy shouted down he and Rep. Adam B. Schiff, D-Calif. Cummings charged Gowdy had made “several inaccurate statements” before and during the hearing. As the two Democrats zeroed in on Blumenthal’s private testimony, Gowdy brought the hearing’s most memorable moment to a close. “If you think we’ve heard … about Sidney Blumenthal, wait ‘til the next round,” he said, banging his gavel loudly and adjourning the panel’s first round of questioning. Republicans took turns reading from emails Clinton received from State Department employees and Blumenthal that they claimed ample — if not most -- blame for the deaths squarely on Clinton’s shoulders. GOP members accused Clinton of being unaware shortly before the attacks that the U.S. still had a diplomatic facility in the Libyan city. They questioned how a secretary of State would be, as she claims, unaware of some of the requests made for additional security. Republicans did not land more than a glancing blow on the former first lady until the three-hour mark approached. That came from House Freedom Caucus Chairman Jim Jordan, R-Ohio, who charged Clinton with misleading the American people about the cause of the attack. He displayed emails and State Department documents on a large video screen, saying she initially publicly pinned blame for the attack on outrage over an anti-Muslim video. But shortly after, Jordan alleged, emails to Clinton&apos;s family and State Department summaries of her conversations with regional leaders showed she believed the strike was a planned and carried out by a violent Islamic group. Clinton described his questioning as misleading, and said she explained things publicly as the department confirmed information that was streaming in from a chaotic scene. “Why didn’t you speak clearly to the American people?” Jordan asked, prompting Clinton to reply she believed she did just that. Warren Rojas and Aisha Chowdhry contributed to this report.